Last month, the Israeli Armoured Corps of the Israel Defense Forces(IDF) unveiled the next-generation Merkava Mark (Mk.) 4 Barak Main Battle Tank (MBT). The Armoured Corps is the principal manoeuvring corps of IDF, and primarily bases its strength on Main Battle Tanks. Since 1998, corps has been subordinate to GOC (General Officer Commanding) Army Headquarters, unofficially known as Mazi. According to IDF press release, the MBT's new "smart" elements include artificial intelligence (AI), updated sensors, and virtual reality (VR) capabilities. 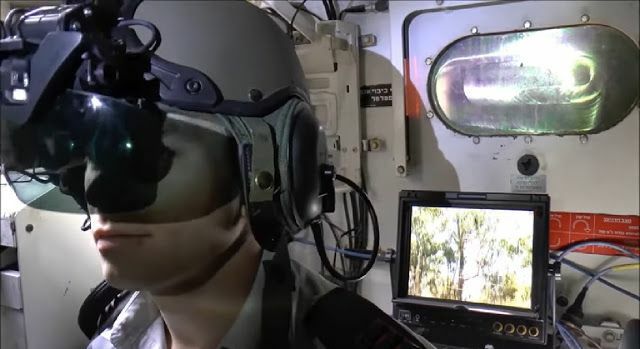 It will have fused sensors, along with a 360-degree camera fitted outside the tank integrated with a new "smart" helmet — Iron Vision helmet-mounted display system, similar to the one Elbit Systems' has developed for the F-35 Lightning II Joint Strike Fighter, will allow the commander of the tank to see exactly what happens outside the tank. Closed-hatch capabilities are just one of the major upgrades planned for Israel's improved Merkava Mark IV tank, which is expected to be ready for trial runs in 2020. Further, the tank will be loaded with a "task computer" that will present all mission-related information to both the crew inside the tank as well as to other tanks and vehicles present in the battlefield via C4I(Command, Control, Communications, Computers, and Intelligence), directly boosting the interoperability of all the vehicles — crucial for accurately locate and strike targets. Currently, the most advanced version of the Merkava in service is the Merkava Mk. 4 Windbreaker MBT, equipped with a second-generation of Rafael's Trophy II "360° Hemispheric" APS (Active Protection System) to foil missile attacks aimed toward it — which include a wide variety of threats ranging from rockets, ATGMs and platform-fired High-Explosive Anti-Tank (HEAT) rounds. After series of tests, the IDF's GOC Army Headquarters declared the Trophy operational in August 2009 and in 2010, first MBT Merkava 4 equipped with the Trophy APS entered in service. "The Armored Corps concludes a significant period of operational successes in various regions, which proves the relevance of the corps in protecting the security of the State of Israel and its civilians," says an unidentified senior official from the Armored Corps. "The new tank brings the Armored Corps a step forward in the operational arena, and constitutes an innovative weapon that will change the face of the combat on the ground."